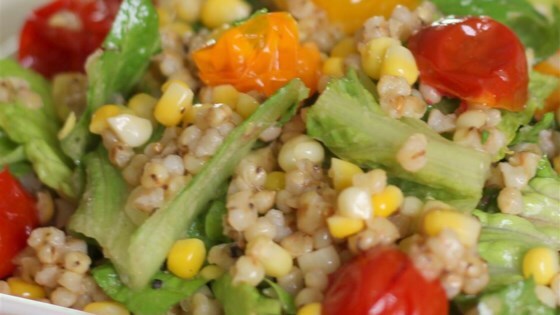 "Barley salad with corn kernels and mixed greens." Bring water and barley to a boil in a saucepan. Reduce heat to low, cover, and simmer until barley is tender, about 30 minutes. Drain any excess water from barley and transfer to a large bowl; stir in 2 tablespoons olive oil. Heat remaining 1 tablespoon olive oil in a large skillet over medium heat. Add corn; cook and stir until slightly softened, about 2 minutes. Stir in tomatoes and scallions; cook until scallions are wilted, about 2 minutes. Mix corn mixture into barley in the bowl. Stir in mixed greens, lemon juice, and lemon zest. Season salad with salt and pepper. Absolutely delicious! I served with a drizzle of balsamic vinaigrette and it was just fabulous. This does make a LOT of salad, though- next time I will cut recipe in half.